For three decades Social Distortion has been raking roots-rock over punk's hot coals. The band (along with The Replacements) foresaw the rise of The Hold Steady and other 21-century indie bands digging Springsteen's America. 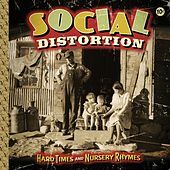 Hard Times and Nursery Rhymes is another solid entry in Social D's discography. Full of scratchy guitars and boisterous twang, it's their most country-flavored effort since 1992's Somewhere Between Heaven and Hell. Main man Mike Ness' love for the catharsis of flight never seems to wane: "We can run to the far side of nowhere/ We're gonna run until the days are gone." 2010 Crime Don't Pay, Inc. Under Exclusive License To Epitaph.